That’s what that Thursday night was supposed to be about. It was meeting them and having dinner with them and getting to know each other. Neither made it to that dinner. Friends and family haven’t heard from Carver or Brown since. The couple’s phones were off, their 2002 Grand Prix was missing, and the front door was unlocked. Inside, Brown’s contact lenses and glasses were sitting untouched, as were their prescription medications. Perhaps even more odd, the couple’s Pomeranian ‘Romeo’ was left inside without food or water. Police followed what few leads they had. Still, two months later, they’ve yet form a theory as to what happened or pinpoint a suspect. Disappearances happen all the time, and while odd, nothing shows the couple left the home under duress. Then again, evidence doesn’t point to an impromptu vacation, either. It’s a mystery. And the mystery got a little stranger on September 1 when Charlie Carver’s Facebook page came alive with a new message that he and Kala had gotten married. A week later, the account became active again, posting a message that stating the couple was fine. The post was later deleted, according to those that managed to snag a glimpse. Carver wasn’t an active Facebook user, according to friends and family. His Facebook page, however, got a lot more lively in the subsequent weeks. Strange images, violent memes, and messages seemingly related to the disappearance (and other missing people) just kept appearing without explanation. His mother claims that he never was one to post meme images, yet the postings are dominated with them of late. Weirder still, the page is responding (on occasion) to comments. The Daily Best even obtained messages the account has sent to friends. im just missing to everyone else. We [are] both ok. there is only one person that knows where we are … the person that means the most to me and kala she know where we are and we are coming that way for ever. 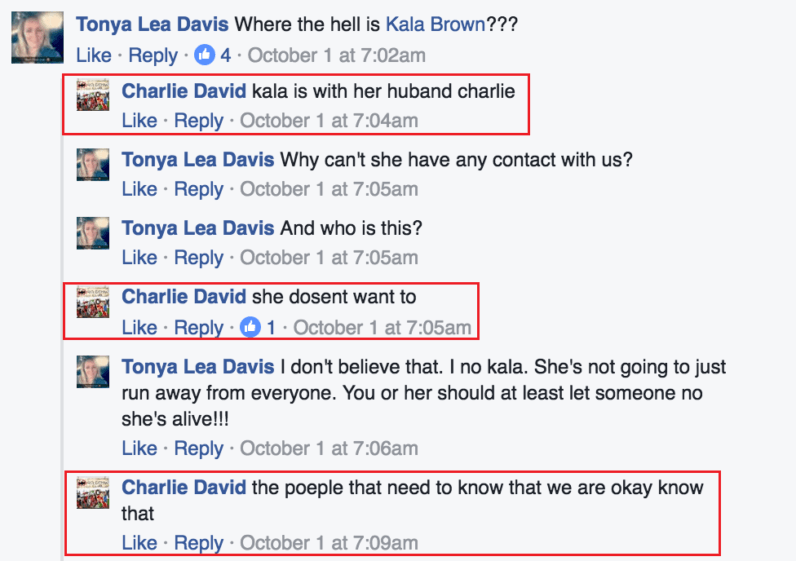 While Charlie’s account remains active and at times responsive, Kala’s account hasn’t been updated since August 27. There’s no clear-cut answer on who is currently in control of the account. For now, it remains a mystery. A mystery the local police don’t seem to be all that concerned with getting to the bottom of. Sounds like a case for Reddit.